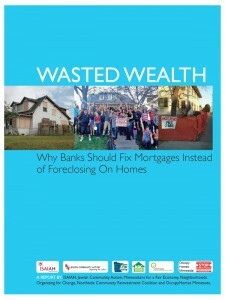 Minneapolis — A coalition of community organizations, faith groups and Occupy Homes MN Thursday released a report arguing that homeowners, the local tax base, the economy and banks themselves would all benefit if lenders reduced the principal on underwater mortgages and did more to help borrowers avoid unnecessary foreclosures. “This was a crisis caused by a system of corruption that preyed on the vulnerable and people of color. It was not caused by individual homeowners who have suffered the greatest burdens and are left with too few solutions. We need bold action from our policymakers from the local to the national – implementing principal reduction and foreclosure mediation to protect our families and rebuild our communities,” said Rev. Paul Slack, Pastor, New Creation Church Minneapolis and President of ISAIAH. Lenders with a history of improper mortgage servicing and foreclosure practices account for at least half of the foreclosures in Minneapolis. On average, banks lose more than $93,400, or half of the principal they are owed, when they foreclose on a home in Minneapolis. Banks could forgive the principal instead, keep many more people in their homes, and still come out ahead. Underwater homeowners in Minneapolis would need an average principal reduction of 35 percent to get right side up, significantly less than the loss banks incur on foreclosures. If banks reset mortgages to current interest rates and market value, they could save underwater Minnesota homeowners an average of $365/month on their mortgage payment, pumping more than $402 million into the local economy every year, which would help create more than 5,941 new jobs annually. “It is our hope this study proves to policy makers and the wider community the necessary and immediate steps we must take to end the housing crisis that is tearing up our communities. 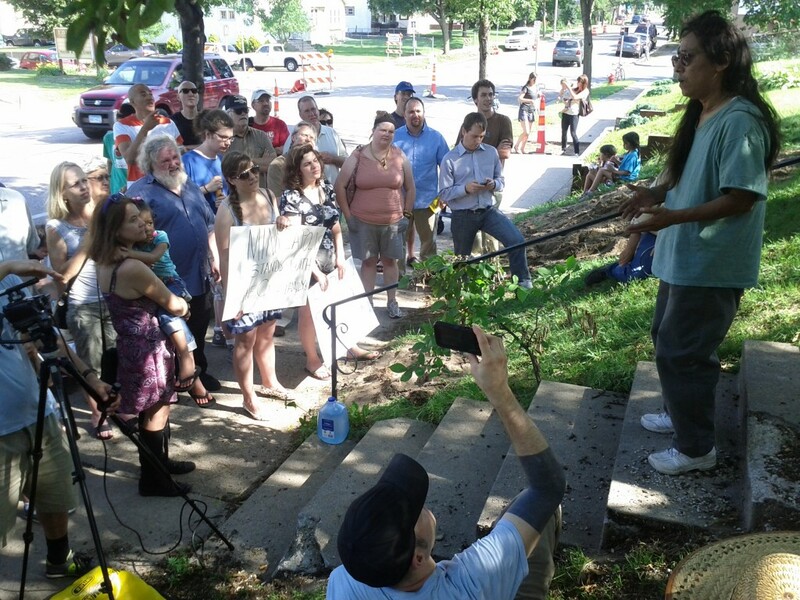 We call on legislation that immediately halts foreclosures, demand principal reduction for all underwater homeowners,” said Jillia Pessenda Bovino, a spokesperson for Occupy Homes MN. The report recommends steps lenders, homeowners and all levels of government could take to reduce foreclosures and end the destructive mortgage crisis caused by reckless and predatory banking practices. “We’re not asking for a handout. We’re just asking banks to start working with us. My loan modification proves that they can fix these problems when they choose to. Now we need them to offer the same option to others in my position. We need these bankers to start acting like community members and not greedy crooks,” said Monique White, a north Minneapolis homeowner who worked with Occupy Homes MN and the community organization Neighborhoods Organizing for Change (NOC) on a successful campaign to get U.S. Bank to renegotiate her home mortgage and allow her to avoid foreclosure. ISAIAH, Jewish Community Action, Minnesotans for a Fair Economy, Minnesota Neighborhoods Organizing for Change, Northside Community Reinvestment Coalition, and Occupy Homes MN jointly released the report. Minneapolis– Three days before Connie Gretsch’s eviction hearing, she was shocked to receive good news: The Attorney General’s office had discovered that her prosecuting bank, Pacifica, did not own Connie’s south Minneapolis home, or even have a license to do business in Minnesota. Pacifica’s attorneys quickly called off the eviction hearing. 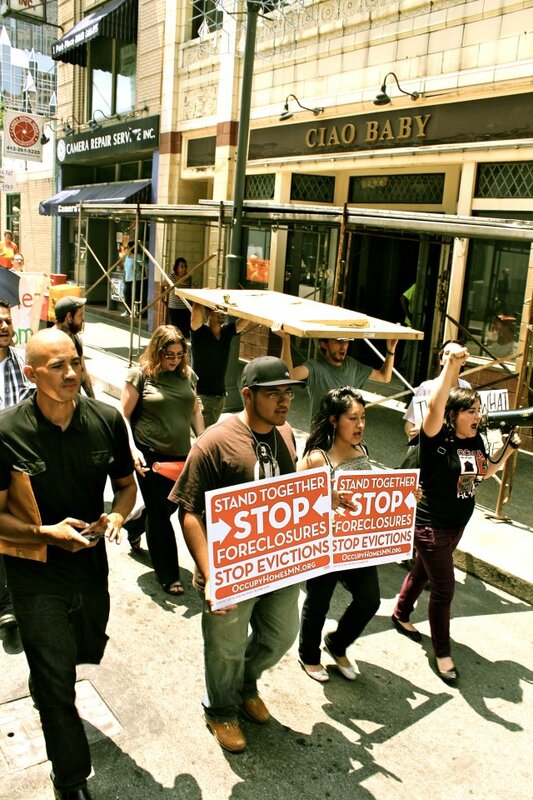 Pacifica has asked Citibank, which currently owns the property, not to pursue an eviction. When Connie Gretsch lost her job as a special ed teacher, she began negotiating with Citibank to adjust her mortgage. They informed her that she had to be two months behind on payments before they could consider her for a loan modification, and advised her to not make payments for two months. After a year of consideration, Citibank rejected her application. They sold her mortgage to Pacifica, which quickly foreclosed on her because she had missed two months’ payments–the payments Citibank had advised her not to make. This summer, Pacifica filed to evict her. When her home fell into foreclosure, Connie thought she would have to leave her home of 17 years where she taught her daughter how to read and cook. Today she is unpacking her boxes and inviting her neighbors over to celebrate her eviction cancellation. 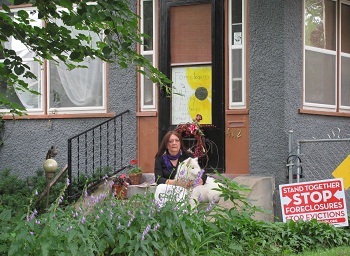 Along with Occupy Homes MN, Connie is building community support to pressure the bank to negotiate with her. This Sunday at 6:00pm, she will have a celebration BBQ for her neighborhood. Her house is at 4112 10th Ave S, Minneapolis, MN. 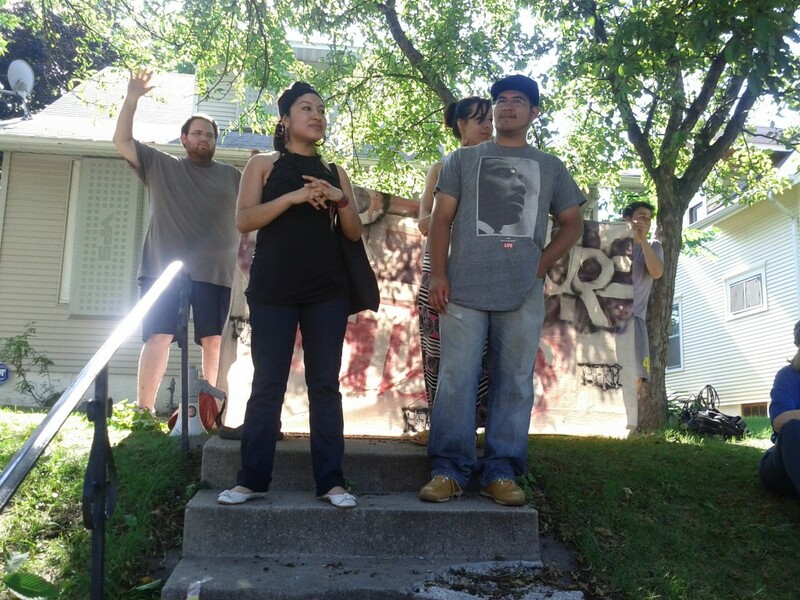 Anita Reyes-Reley planned on moving out of her South Minneapolis home last Tuesday when she received an eviction notice from Hennepin County Sheriffs. Now she is unpacking her boxes, planting a garden, and building community support to stay in her home. “All that I am asking is for Woodlands National Bank to sit down and negotiate with me, so I can stay in my community,” said Anita. Ms. Reyes-Reley, who has owned her home for 17 years, fell behind on her mortgage when her hours were cut and vertigo prevented her from making the 100-mile one-way drive to work. She reached out to Cindy Koonce, Vice President at Woodlands National Bank, to find a solution to stay in her house. Ms. Koonce told Anita she would do everything she could to help her. The Attorney General offered to look over Anita’s loan documents for the bank. 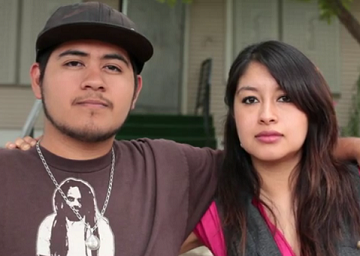 Anita returned to work, earning more than enough to afford her mortgage. To Anita’s shock, however, on the end date of her redemption period, Ms. Koonce called Anita and told her she needed to leave her home. 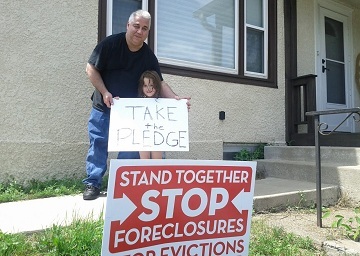 With the help of Occupy Homes MN, Anita began building a public pressure campaign, including call-ins and a petition, for Woodlands National Bank to renegotiate her mortgage so she could stay in her home. That same day, Ms. Koonce called Anita and made a concrete offer to keep her in her home. But the following day, when Anita showed up to negotiate, she was told that the offer was off the table due to a minor technicality: she had called the bank four minutes too late. 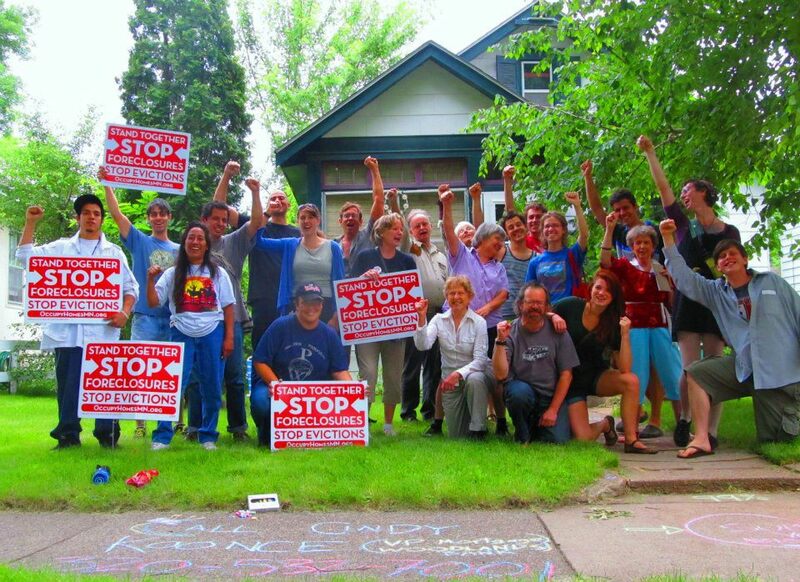 Occupy Homes MN, which recently garnered media attention from around the country for its continuous defense of the Cruz home after eviction orders were posted, vowed to begin a similar eviction defense and public campaign. The American Indian Movement has also pledged its support. 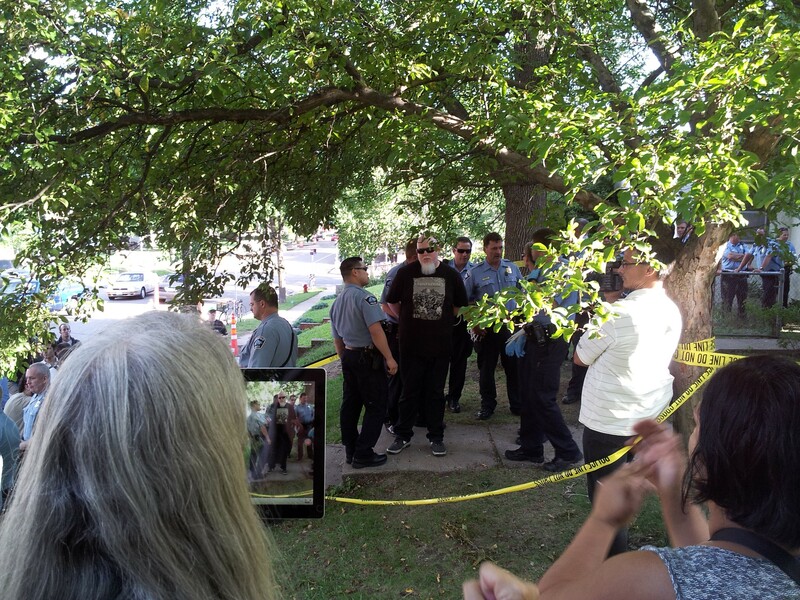 Minneapolis Police Chief Tim Dolan steps on peaceful protesters outside the Cruz home May 30. Fourteen were arrested that night, and so far at least three have received riot charges. 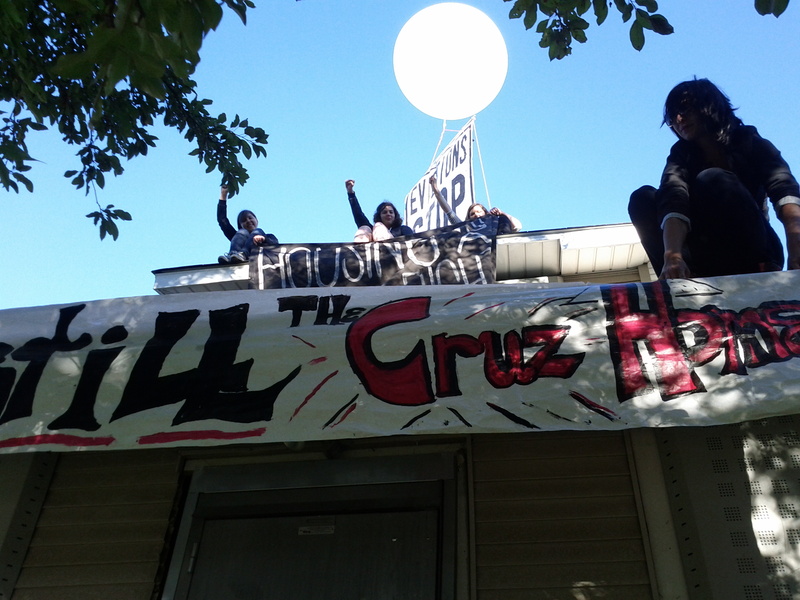 Yesterday, several activists with Occupy Homes MN discovered that the City Attorney has decided to escalate charges following their arrests defending the Cruz family home. Prosecutors at the City Attorney’s office originally charged the group of Cruz family supporters with trespassing, and have now moved to significantly more serious charges including 3rd degree riot–a gross misdemeanor which carries a sentence of up to one year in prison and a $3,000 fine. These charges are a clear and disgraceful attempt to suppress the Occupy Homes movement and ‘make an example’ of anti-foreclosure organizers who were arrested while non-violently protesting an unjust eviction. City Attorney Susan Segal, appointed by Mayor RT Rybak, has also made it a point to aggressively prosecute other political defendants, including a group arrested while protesting US Bank’s foreclosure practices last fall. Instead of prosecuting the criminal fraud of the bankers that crashed our economy, or working to give relief to families devastated by the foreclosure crisis, our tax dollars are being spent to evict families at the banks’ behest, and to intimidate and prosecute neighbors fighting to keep more vacant homes out of their communities. The fight to defend the Cruz family from a wrongful and unnecessary eviction has garnered support from hundreds of thousands of supporters around the country with solidarity actions in over a dozen cities, and has sent a message to big banks everywhere that we won’t stand by and let them steal our homes. This attempt to silence and stifle anti-foreclosure organizing will not deter us from fighting for our homes, our families, our neighbors, and our futures. For more updates and ways to support the defendants, follow www.occupyhomesmn.org, http://www.facebook.com/OccupyHomesMN and www.twitter.com/OccupyHomesMN. Please donate to our legal fund here to help cover the costs of this attack on our movement. Internationally renowned hip-hop artist Brother Ali was the first to cross the police line and face arrest. 125 community members gathered at the home of the Cruz family in South Minneapolis and 13, including hip-hop artist Brother Ali, were arrested when they crossed the police line to protest PNC Bank’s inexplicable reversal of their commitment to work with the family after the family fell into foreclosure due to a bank error. In front of the crowd of supporters, each of the 13 spoke as to why they were willing to cross the police line before asking the officers to allow them to step onto the property and be arrested, bringing the total arrest count at the home to 39 within the past month. In Pittsburgh, after reaching PNC Bank’s national headquarters, the Cruz family has vowed to return to headquarters at noon on Friday to demand a good faith negotiation. Despite the fact that the Cruz family drove 800 miles to hand deliver their loan modification documents in person, along with over 40,000 petition signatures, PNC Bank refused to work with the family to find a solution that would keep them in their home, inciting outrage and disgust among the family’s supporters. Alejandra and David Cruz, along with 40 supporters, marched to PNC Bank’s Pittsburgh headquarters with the door to their south Minneapolis home that was beaten in by sheriffs in a 4 am raid. Thursday night’s rally at the Cruz family home concluded a nationwide day of action in which 18 cities rallied to demand PNC negotiate with the family to allow them to return home. In Pittsburgh, 40 supporters rallied with the Cruz caravan and marched with the door to the Cruzes’ home that was violently smashed by the Hennepin County Sheriff’s deputies during a 4:00am raid. Although Alejandra, David and Anthony met with PNC representatives for an hour and submitted their loan modification documents, PNC Bank still refused to negotiate, dismissed their request for a modification and openly displayed contempt for the family. PNC’s inexcusable behavior demonstrates to the family’s supporters both in Minneapolis and across the nation that PNC would rather see homes sit empty than work with families. 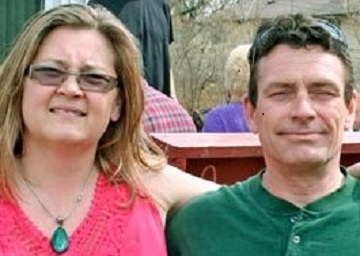 Their lack of integrity was apparent when the PR representatives condescendingly told Alejandra and David that “based on your payment history, we don’t think you’d be able to pay for the house,” though they were unable to produce any evidence of missed payments. 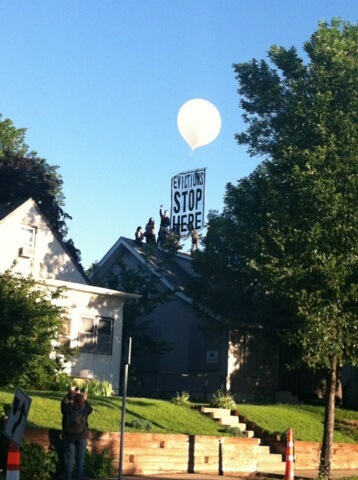 Minneapolis – Around 6:30am this morning a large balloon banner reading “Evictions Stop Here” was deployed above the embattled home of the Cruz family as 15 supporters of the Cruz family began an occupation of the rooftop in protest of the family’s unjust foreclosure. By 8:30am two were cut out of a lockbox device with an electric saw, handcuffed, taken down a ladder and arrested for trespassing. The action kicks off a national day of action in 18 cities demanding PNC Bank negotiate with the family to allow them to return to their home. Watch video of the two rooftop occupiers’ arrest here. Alejandra and David Cruz will arrive at the bank’s headquarters in Pittsburgh around 1pm with over 40,000 petition signatures and their loan modification documents demanding a meeting with CEO Jim Rohr to renegotiate their mortgage. 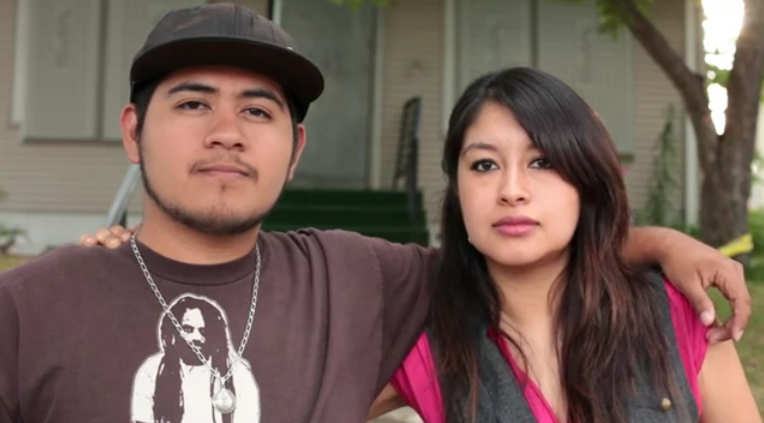 The Cruzes’ battle against an unjust foreclosure has become a focal point for the Occupy movement and garnered media attention from around the country. 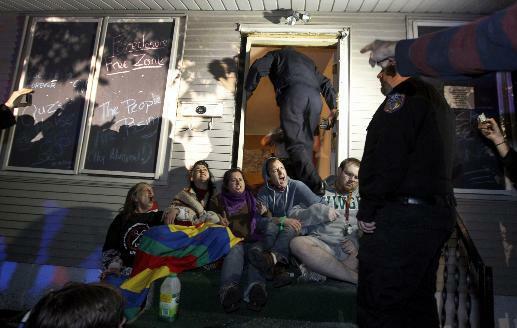 In the past month, 24 community supporters with Occupy Homes MN have been arrested defending the south Minneapolis home. The campaign has become a sticky political situation for local elected officials, PNC Bank, and Freddie Mac, the current owner of the property. On their way to Pittsburgh, the Cruzes stopped in Chicago to visit Freddie Mac, the current owner of the home, at their regional office, where 40 supporters rallied with the Cruzes’ battered front door. Supporters then marched to a local PNCbranch where they were denied entrance by Chicago police officers and the branch refused to accept the Cruzes’ loan documents. More photos of the balloon launch can be found here. THURSDAY 6/21: National Day of Action Against PNC Bank. As the Cruz family arrives at PNC Bank headquarters in Pittsburgh, supporters will rally across the country to demand that PNClive up to their word and work with the Cruz family. We’re going to do our best to keep everyone posted as to what’s going on throughout the day of action on this liveblog! Send us a comment, tell us about your actions, ask a question, find out more! After a massive public pressure campaign, Woodlands National Bank called foreclosed homeowner Anita Reyes-Reley Tuesday and made a concrete offer to keep her in her home. Today, when Anita showed up money in hand, expecting a negotiation, she was told that the offer was off the table due to a minor technicality. “This is my Trail of Tears. It may not be the same distance, but it’s the same heartache,” said a distraught Anita Reyes-Reley, a member of the White Earth reservation who has owned her home for 16 years. 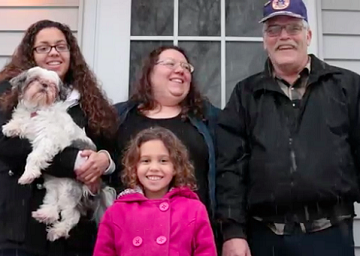 Anita went into foreclosure when her vertigo prevented her from driving to work. She now works full-time at a casino and is more than able to pay her mortgage. But despite four separate offers from the Attorney General to look over the proper documents, Woodlands Bank has refused to agree upon a good faith negotiation that would keep Anita in her home. Tuesday morning, the sheriffs arrived at Anita’s home to post a 24-hour eviction notice. While Anita contacted family and friends, Occupy Homes mobilized dozens of neighborhood supporters, repeatedly flooding Ms. Koonce’s voicemail with messages of support for Anita and securing nearly 200 petition signatures. Later that day Vice President Cindy Koonce called Anita from her personal cell phone, offering to drive down to Minneapolis to negotiate. However, when Anita arrived to begin negotiations on Wednesday, she was told that the deal was off. “She needed to let us know by noon today if she had the money… It was not before noon,” said Joanne Whiterabbit at the Minneapolis branch of Woodlands Bank. “We’re done.” Anita had called Ms. Koonce at 12:04 pm. Neighbors rallied at a barbecue at Anita’s home last weekend to discuss how foreclosures affect their community and pledged support to Anita as she fights for her home. 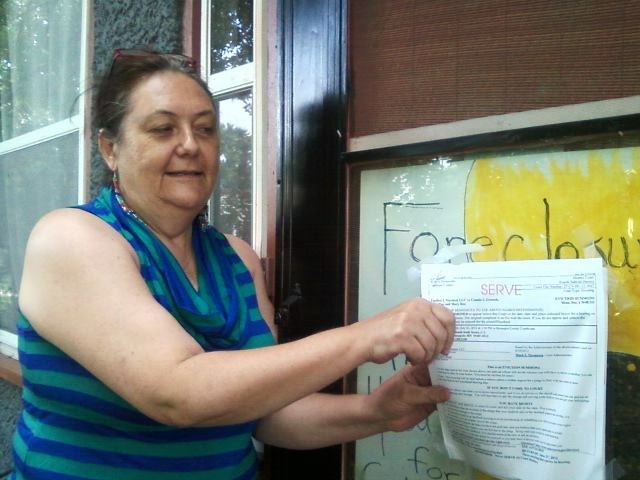 This morning, homeowner Anita Reyes-Reley was served an eviction notice on the door of her home of 17 years. Yet in a dramatic turn of events, by 3:00pm she received an offer from Woodlands National Bank that would keep her in her home. 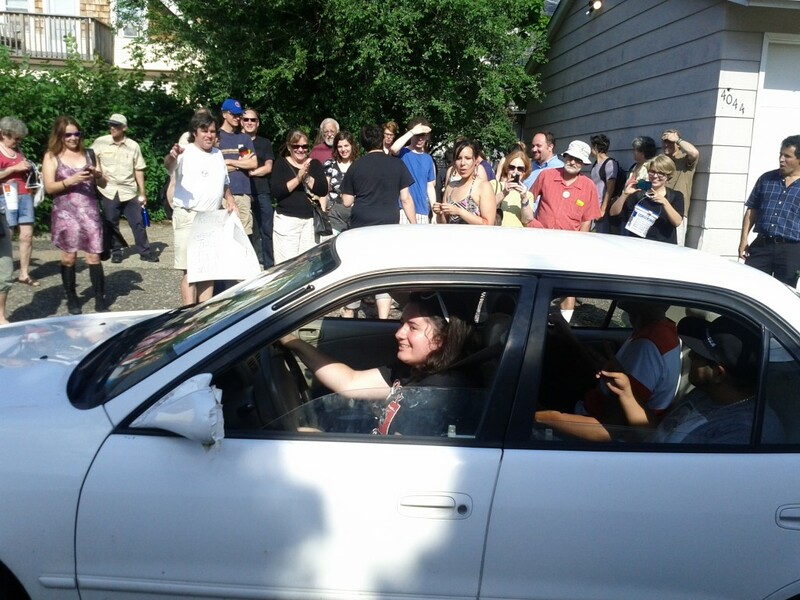 This improbable victory, the second for Occupy Homes MN in one week, comes after community supporters successfully lead a pressure campaign consisting of phone calls, emails, and a petition to the bank demanding they negotiate a new loan for Anita. This announcement was shared with 60 community members, including nationally renowned local hip-hop artist Brother Ali, in front of the Cruz family home. The community rallied today to send off the Cruz family, whose battle against an unjust foreclosure has become a focal point for the Occupy movement, to PNC bank headquarters in Pittsburgh to renegotiate their mortgage. The rally and Anita’s victory mark the kick-off of a coordinated week of actions across the country designed to bring national attention to the Cruz family’s situation. “Our family can’t believe how much support we have received from around the country in our fight to save our home. We are so thankful for each and every one of you,” said Alejandra Cruz. The Cruz family will travel 800 miles with their loan modification documents to demand a meeting with PNC Bank CEO Jim Rohr, and ask the bank to renegotiate their mortgage. On the way, they will visit Freddie Mac, the current owner of the house, at their regional office in Chicago. 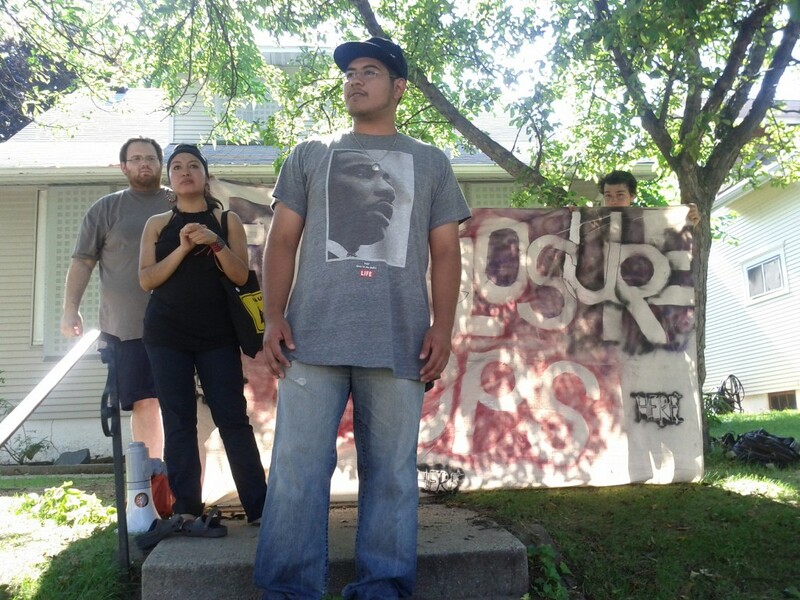 In the past month, 24 activists with Occupy Homes MN have been arrested defending the Minneapolis home of the Cruz family from a foreclosure that began when PNC Bank failed to withdraw an online mortgage payment. David and Alejandra Cruz, who have already played a role in a successful movement for justice as DREAM Act activists, say their family can pay a mortgage and want to meet with bank officials to negotiate an agreement that will allow them to return to their home. WEDNESDAY 6/20, 1pm: Rally at Freddie Mac office, Chicago, IL. The Cruz family will make a stop at the regional headquarters of Freddie Mac, the bailed-out secondary market lender that has posted guards and boarded up the doors and windows with reinforced steel to keep the Cruz family and supporters out of their home. As the Cruz family arrives at the PNC bank headquarters in Pittsburgh supporters will rally across the country to demand that PNC live up to their word and work with the Cruz family. Rallies in support of the Cruz family are planned in Atlanta, Baltimore, Cincinnati, Detroit, Gainesville, Greensboro, Milwaukee, New York, Newark, Philadelphia, St. Louis. Our family can’t believe how much support we have received from around the country in our fight to save our home. We are so thankful for each and every one of you. After PNC Bank committed to working with our family to resolve this issue 23 of our friends and supporters were arrested during 5 eviction attempts in one week and PNC stopped returning our calls. That’s when we decided it was time to raise the stakes. In just a couple hours, my brother David and I will embark on a caravan to PNC Bank’s national headquarters in Pittsburgh to attempt to hand deliver our family’s loan modification documents to Jim Rohr, the CEO. We hope to give him a chance to personally correct PNC’s mistake and make things right for our family. Over 15 cities across the country have committed to rallying at PNC Bank branches in support of our family as part of the #J21 national day of action, and we believe that we are on the verge of finally getting justice for our family. Can you take a few minutes to support our family and share my petition with 5 friends? You can also follow: www.twiitter.com/OccupyHomesMN and hashtags #J21 and #CruzHome for more updates on our trip.